African Seed Trade Association (AFSTA) members with an interest in plant breeding for the development of improved vegetable varieties can now tap the knowledge and expertise of the World Vegetable Center (WorldVeg), an internationally renowned leader in crop research, by joining the Africa Vegetable Breeding Consortium—a joint initiative of WorldVeg and AFSTA. WorldVeg, a non-profit agricultural research and development institute, strives to realize the potential of vegetables for healthier lives and more resilient livelihoods. WorldVeg carries out its mission by forming research partnerships with government, non-governmental, and private sector organizations to conserve and utilize vegetable biodiversity, improve vegetable varieties, and increase vegetable production, marketing and consumption. As advances in biotechnology and genomics accelerate the pace of vegetable cultivar development, seed companies of all sizes must have a robust understanding of the latest vegetable breeding research, the practical skills to apply new breeding methods, and access to a diverse collection of vegetable germplasm to remain competitive in turbulent markets. Through the Africa Vegetable Breeding Consortium, participating companies and WorldVeg researchers will have multiple opportunities to discuss and evaluate breeding approaches and discover new avenues to share data and progress. 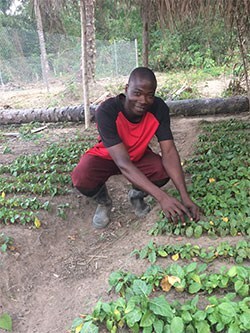 WorldVeg is the source for improving incomes and livelihoods for Africa’s farmers. Our plant breeders draw on the wealth of genetic diversity in the WorldVeg Genebank—the world’s largest public-sector collection of vegetable germplasm—to develop climate-smart, resilient, productive vegetable Varieties with enhanced nutrition, tolerance to heat and drought, and better resistance to pests and diseases. Consortium members will have a 12-month head start to access new improved WorldVeg lines. The consortium initially will focus on African eggplant, African indigenous vegetables, amaranth, brassica, carrot, mungbean, pepper (chili and sweet), and tomato. At the Annual Workshop—an event held exclusively for consortium companies—WorldVeg researchers will demonstrate new outputs of the vegetable improvement program and discuss results obtained by consortium members who test WorldVeg breeding lines at their field sites using WorldVeg experimental protocols. Each workshop will last two consecutive days and be held at one of WorldVeg’s regional centers, located in Benin, Mali and Tanzania. Location, dates, and format of workshops will be decided annually by WorldVeg in consultation with consortium members. WorldVeg will offer free workshop participation to one representative from each consortium company (includes lodging, meals, transportation within the country where the workshop will be held, workshop materials and coffee breaks). All workshop participants must cover their transportation costs to reach the workshop vicinity. Preliminary yield trials (PYT) are an advanced testing stage from which WorldVeg selects entries for public distribution through an on-line seed catalog. Consortium companies will be able to view a broad array of PYT entries in the field at least 12 months before the material is made public. Participants may have early access to screening protocols or other kinds of scientific information developed at WorldVeg, provided the sharing of such information does not conflict with existing WorldVeg agreements or policies. WorldVeg will e-mail news and information of potential interest to consortium companies at least one other time (in addition to the workshop) every calendar year. Expect exposure to new relevant literature about germplasm screening, breeding methods, and WorldVeg breeding lines. You’ll also receive a copy of the Center’s Annual Report. Consortium companies can request ten free seed acquisitions per year from WorldVeg, subject to seed availability and phytosanitary clearance of requested accessions/lines. Staff from consortium companies receive preferential access and a 20% discount on tuition for WorldVeg-offered training. This benefit extends to all employees of a consortium company. • Regular feedback from evaluation trials of improved breeding lines. WorldVeg scientists will specify the traits to be monitored and provide experimental protocols. • Feedback on trait development that consortium companies would like WorldVeg breeding programs to pursue. This information will be gathered through a survey questionnaire developed by WorldVeg and distributed to consortium companies, and through discussions at the annual workshops. • Data on annual seed sales (in metric tons per variety per year) and information on which traits from WorldVeg were used for each variety. For some traits, it is possible to say they came from WorldVeg, while for other traits more than one source may have been used, which can then be indicated. 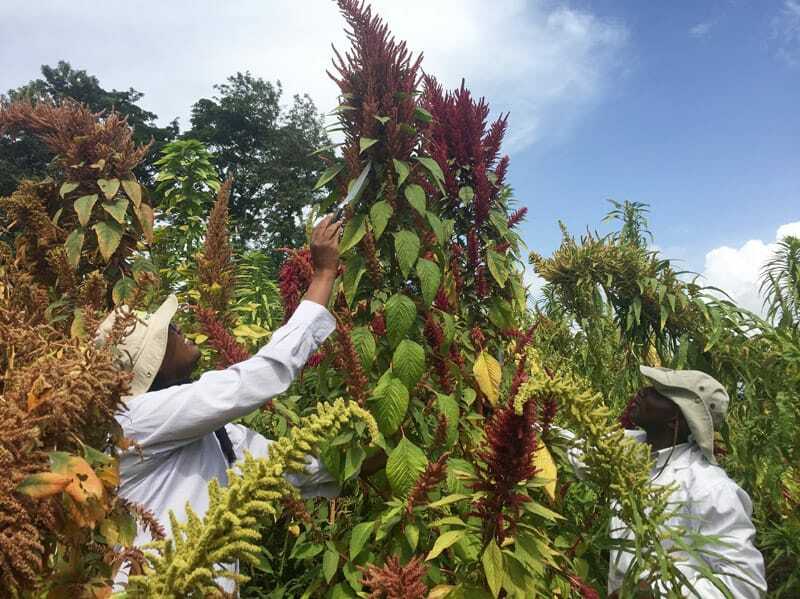 Reaching for the sky, this amaranth plant is one of the many selected for breeding improved varieties at WorldVeg Eastern and Southern Africa. Join the Africa Vegetable Breeding Consortium! Consortium fees are non-refundable. The consortium term is 1 July to 30 June every calendar year. Consortium membership is open to all AFSTA members in good standing.